Thermal imaging is a tool used in home inspections to capture differences in thermal energy that are not visible to the naked eye. These variations in temperature are read and interpreted by a home inspector to give more insight into matters going on behind the ceiling, floor, and walls. Not all home inspectors use thermal imaging during home inspections, however, it is always a good idea to work with an inspector who does. An infrared camera often catches problems that may otherwise go undetected. Infrared thermal imaging cameras resemble large digital cameras or camcorders. A typical thermal camera is used to produce a grayscale image. The grayscale image is then converted into a color picture that offers more insight into the thermal behavior of different components in the home. The image produced is known as a thermogram. Note that the cameras do not measure or see temperatures, they only detect infrared radiation. All objects exist and put out energy at a particular infrared level. Since infrared cameras read heat, you do not need to have light to get results from the camera. 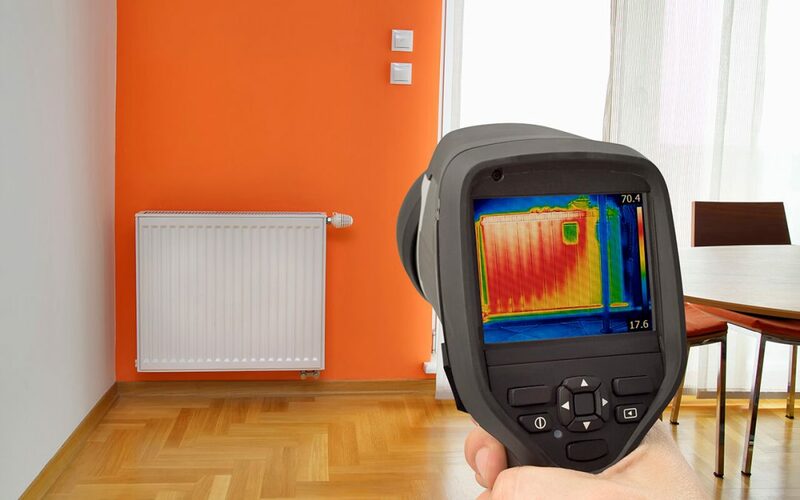 If your home inspector is equipped with a thermal camera, the inspection report will include infrared images of items and areas around the home. The pictures embedded in the report will also have short explanations of what they mean. The thermal energy radiated by a particular component will appear in the image within a spectrum ranging from light to dark. A component that appears yellow has higher thermal energy than one that appears blue. Therefore, if a ceiling is showing a dark area on a thermal image of the ceiling, you may have excess water or moisture in your ceiling that should be investigated further. What Can Thermal Imaging During Home Inspections Detect? Thermal images can provide more insight on different issues like moisture intrusion, electrical hotspots, missing insulation, gaps that must be sealed, and areas of potential heat loss. Electrical hotspots cannot be seen by the naked eye, but they may appear on a thermal image. The excess heat radiated from the electrical hotspot may appear yellow, orange, or white when seen through an infrared camera. It is important to know if there is an electrical hotspot in your home because it can be a dangerous fire risk. Excess moisture or water can cause serious structural damage to your home if it is not caught and repaired early. Fortunately, infrared imaging can assist in locating the source of moisture intrusion or water leaks. This is because areas with moisture intrusion will appear as an unusual cooler section on the thermal image. Not all home inspectors use thermal imaging cameras, but it is in your best interest to hire a home inspector that includes thermal pictures in their inspection reports. Fall is the perfect time to get an energy audit from an inspector who uses thermal imaging so you can best prepare your home for the winter months. HomeVantage Home Inspections serves Northern New Jersey with home inspection services and energy audits. Inspector Joe Mysliwiec uses thermal imaging during home inspections. Contact us to book an appointment.